Take a minute and go down to your home theater system and look at the phalanx of cables and cords and sundry behind your system. Better yet, just look around you if you’re at your desktop computer. We all have good intentions of labeling all of our cords when we set up our electronics systems to make it easier to find and unplug one certain component from the whole system. What usually happens is a lot of frustration and crying because you have to unhook everything in your setup to find the one darn cord you’re looking for. 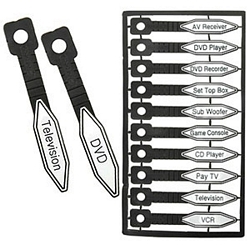 Over at X-treme Geek, they offer Kableflags in the Home Theatre Pack and the Entertainment Pack. These hard rubber labels wrap securely around a cord to mark what it is connected to. Unlike tape, these tags won’t age and get sticky. They’re also pre-labeled to make the whole process of labeling your home theater system or computer system quick and easy. What they’re missing is a Gaming Pack where they’d have labels for all the consoles and a pack of blank labels that you can use to identify those weird items that defy categorization. Each pack is $5.79 over at X-treme Geek.